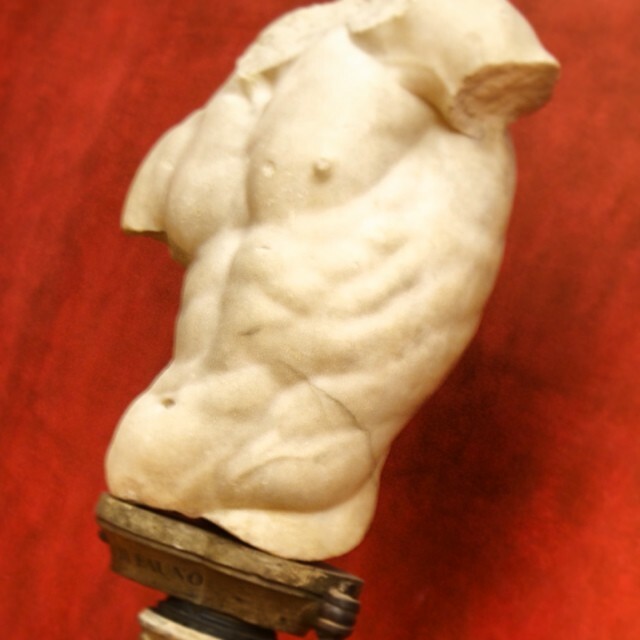 Popularly known as the "Gaddi Torso" for the wealthy Florentine family that possessed it in the early 16th century, this sculptural fragment of a faun or centaur - half man, half beast - was probably "discovered" in Rome. It is of Greek origin, from around the second century B.C. and may have been in the private collection of Lorenzo Ghiberti before coming to the Gaddi. It is one of the most perfect pieces of sculpture I have ever seen (yes, I am putting this piece up there with the Pietà of Michelangelo) - it is so alive, so coiled - I always expect to see it spring off the pedestal. I am not sure why the scholarship has the history as it does, it is hard to find a lot of detail on pieces like this in English. But why it is listed as "Fauno" and not just a fragment from something else is purely an interpretation of the pose - the centaur tied with his hands around his back is an iconic image of the late Hellenistic period - and it must be assumed that is what scholars see when looking at this. Remarkably and I think correctly it has never been "restored" - meaning hands, arms, legs, etc. attached from speculation. If it had been I think it would have lost much of its power. This (smuggled) photo is from part of the "New" Uffizi and this piece's new permanent home. It used to be in the first room on the right in the main corridor on the top floor (when you reached the top and "entered" the museum proper, you would have to turn to the right and look at it from the corridor in the room full of other Greek and Roman sculptures). Now it is in the newly renovated part of the museum on the opposite side, which is painted a rather gaudy red. Again, according to current scholarship this was how these salons were originally set up and painted. I don't mind the color as much as the hallway like feeling of the room - the viewing experience, after all this work on the new rooms of the museum, seems cramped and rushed as most people at this point are just shuffling to the exit. Still, this piece alone is in my top ten reasons to visit Florence. Try to see it off season or late in the day so you can spend some time in front of it without huge crowds around you.